Click the + (plus) sign icon above the Datacenters pane. Important: The datacenter name cannot be edited after clicking Save. Datacenter names must be unique within a cluster. Name Enter a name for the datacenter. Datacenter names must be unique within a cluster. Config Profile Select a configuration profile to apply at the datacenter level to override inheriting the configuration profile from the cluster level. SSH Management Port Enter a port value if you do not want to inherit the value from the cluster. 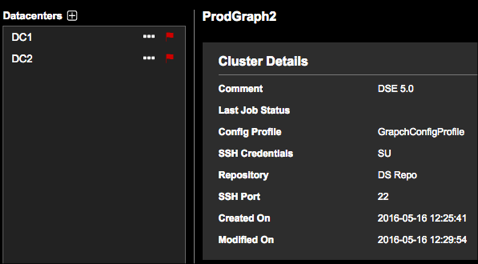 Default value for the SSH port at the cluster level is 22. Comment Enter a comment about the datacenter that identifies its purpose or location. For example: DC East Coast Production DSE v6. 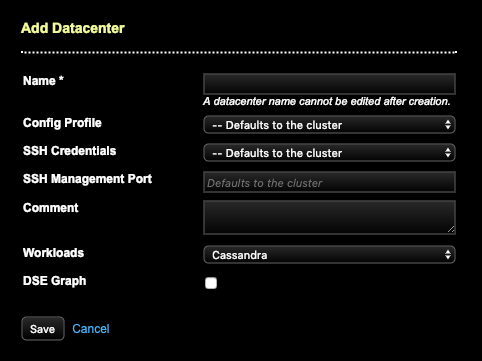 DSE Graph Select the DSE Graph option if the datacenter is for a DSE Graph database.